I notice that the previous review was mine so here's another! Having had to reschedule my annual stay due to refurbishments in the bar, I stayed for 4 nights last week and, as ever, everything was to my liking. The refurb has been tastefully done with smart new furniture and the welcome addition of two more handpumps. I've always like Robinson's and the beers on offer are Unicorn, Wizard, Trooper and Magnum IPA. I tried the first three on my first night but settled for Wizard for the rest of my stay. All were in great nick and well served by the lovely Bridge End ladies Alison, Carly, Sian and Jenny. The size of the menu is smaller but the two dinners I had were excellent although I hope to see one or two from the old menu reappear! This is my second home and I'll always come back. I recently stayed for four days at the Bridge End for the first time although I'd been in for a pint before when on canal trips. I was lucky enough to book the only single room in the hotel (no single supplement!) which was very comfortable although the mattress was a tad hard! A nice view down to the famous bridge and River Dee from the window was lovely and I felt very much at home. The Robinson's beers were in top order in the comfortable bar and I was very well fed from the extensive menu. Made the staff laugh when telling them of my grannie's comments as to why we didn't go for a drink in the Bridge End when on holiday with her and granddad in 1972, "We don't drink in the Bridge End". I never did find out why but, in the words of Arnie, "I'll be back"! handy finishng point after a canal walk,friendly attentive staff.seating on front of pub is a real suntrap.seems to cover a few bases with a cosy bar (seems popular for the locals) and a seperate dining area.had a couple of pints of robinsons unicorn which was in good order & a pub dinner before getting the bus to this pubs namesake in ruabon. 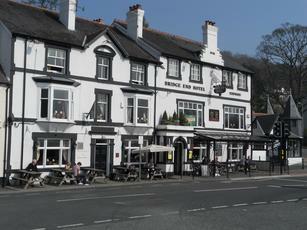 Busy and excellent Robinson's pub / hotel in the centre of Llangollen, which is very welcoming. The Robbie's ales are served in tip-top condition. Excellent food is served in generous portions and is reasonably priced. The accommodation is also excellent and good value.